"We now have some difficulties due to management problems," says the company Xingkong. The sudden closure of the nationwide piano training company Xingkong has sparked anger in Shanghai, where the firm has 14 stores. At one store in the CapitaMall in the city's Xinzhuang area in Minhang District, many parents turned up to demand an explanation on Saturday after learning about the company's closure from their friends or via the Internet. Xingkong released a statement over the weekend after the closure of all its outlets, explaining that it now had "some difficulties due to management problems." It pledged to provide "a solution" as soon as possible. 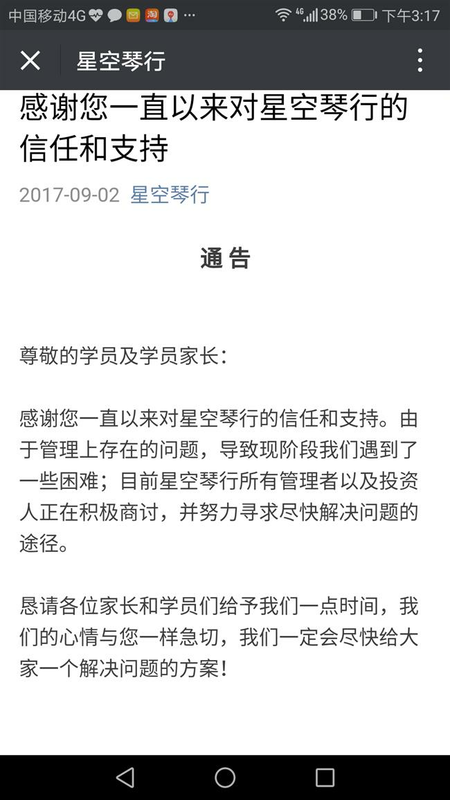 The statement, released on its WeChat account, also said that all the managing staff and investors of the company were having active discussions to find out a solution, asking students and their parents to give them some time. Xingkong, or starlit sky in Chinese, had about 60 outlets at shopping malls in 19 cities across China, including 12 in Beijing and the 14 in Shanghai, according to its website. It claimed that it was founded in 2012 by a former managing team of Alibaba and some musical experts and its main business was “home delivery” teaching for children, but also providing small-sized classes for adults and children in its stores. No obvious signs of the company being in difficulty were announced nationwide before the weekend and the company’s WeChat account had been updating with promotion of courses and discounts till Friday. But students found the stores did not open on Saturday morning when they went to attend lessons. The message was spread rapidly online. At the CapitaMall store, all concerned parents and visitors found was a mall security guard sitting in front of the closed door, telling them to register at an information desk in the basement. 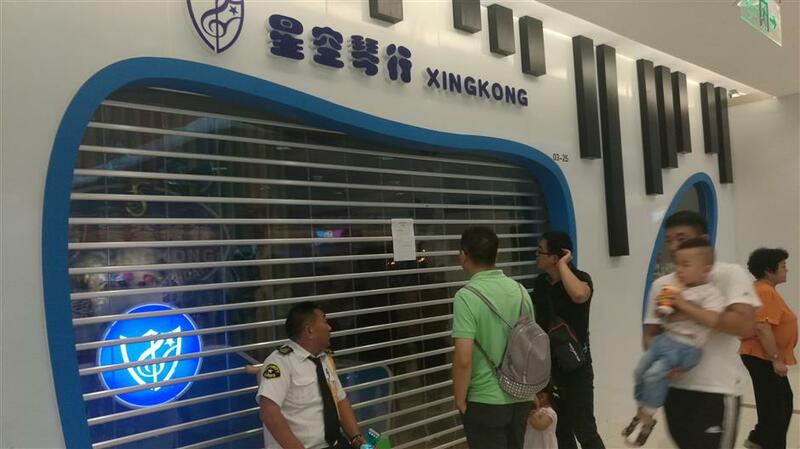 The guard said some parents brought their children to Xingkong starting at around 10am on Saturday for a class but found the store closed. They turned to the mall’s information counter for help and called police, who later came and launched an investigation. A notice was also put on the door by the mall's property management company, stating the store had closed without informing the mall, which has already reported the incident to related government departments. An old lady, who was accompanying her granddaughter playing at an amusement store opposite the Xingkong store, told Shanghai Daily that there had been some local signs indicating the sudden closure. Nearly 100 people had left their personal information, including names, mobile phone numbers and numbers of unfinished classes, at the information desk by 5pm on Saturday. All had dozens or even hundreds of classes undelivered, with each class priced about 200 yuan (US$30), and some also had laid out tens of thousand yuan in deposits for renting pianos. One business model for Xingkong was to rent or sell a piano to families and then send teachers to teach children at home. Another mother was more furious as she had just paid 50,400 yuan on Wednesday to rent a piano and buy a one-year course for her 5-year-old daughter. She also told Shanghai Daily that she had reported the matter to the police. The mother showed a letter sent by store staff in her class WeChat group, explaining the closure. It said the company had been expanding their business besides pianos in the past year, increasing operation costs and making the capital chain vulnerable. The sudden closure of stores was caused as the wages, which should have been paid to part-time teachers on August 20 and full-time teachers on August 10, were postponed to be paid on September 11 due to problems in the receiving of investment capital. Some teachers could not accept the delay and decided to stop teaching, which made some parents believe that Xingkong had gone bankrupt and they had gathered at some stores to try to safeguard their rights,the WeChat letter said.To avoid any violent confrontation, the stores were closed. Another parent showed a message sent by a teacher, saying that she had decided to stop teaching as the company still owed her two months' wages. She said she would resume teaching if Xingkong returned to normal operation but she had to prepare for the worst result. Another letter spread online, which was said to be sent to Xingkong students by its chief executive Zhou Kaicheng, also confirmed that all outlets in the country had suspended operation. It said that the managing team did not hold any stock shares of the company now and were waiting for the decision of the new investors. Xingkong "wasn't bankrupt." 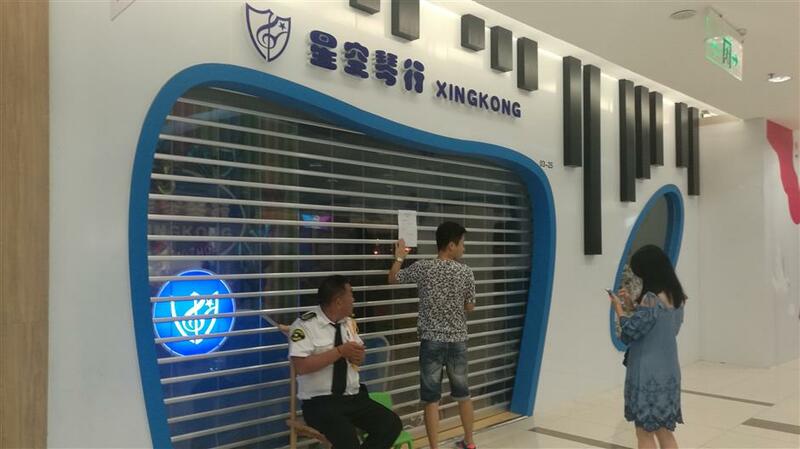 Attempts to reach the service hotline of Xingkong proved fruitless, with the voice system announcing that all customer service staff were busy.